When? After you have setup a Student profile, you can create a Teacher profile. Also, after you have setup a Teacher profile, you can create a Student profile. Why? When you have a teacher profile and a student profile, you are both a teacher and a student! For example, you can use the Lingworld credits earned from teaching Mandarin for paying for English classes/conversations, and vice-versa. This guide is about setting up a Teacher profile in addition to a Student profile that has previously been created. For information about setting up a Student profile, see the Creating a Student Profile guide. 1. Click Add Teacher Profile in the Teach as well? section of the navigation pane. 2. The My Profile [Add Teacher Profile] screen opens. 3. 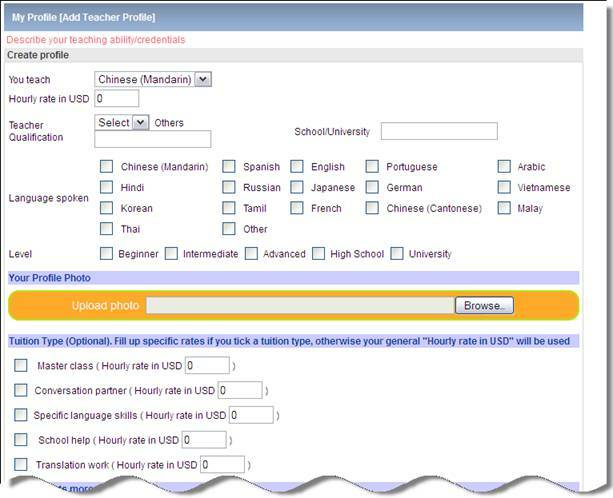 Fill out the fields on the My Profile [Add Teacher Profile] screen as accurately as possible. The My Profile [Add Teacher Profile] fields are described below. 4. Once you are finished filling out the fields as accurately as possible, click the Create profile button. Your Teacher profile is created and is accessible by clicking the Change to Teacher link in the Change Role section of the navigation pane.